Has anyone tried to install a larger TV into their R Pod. We have a 175 and I have been toying with the idea of taking down the 9" tv/DVD player from the wooden mount over the bed and hanging a 19 inch plasma. Seems like it will hold but was wondering if anyone else has found a place to put a larger TV in the Pod. I was going to but have decided to keep the 9" inch under the counter tv because the wife loves to use it while cooking. I did buy a 23" lcd monitor which I will bring with us and place on the counter. I bought the monitor because it had HDMI input and I can hook up my PS3 to it and watch Blu-Ray movies at 1080p. Plus I love playing games on the PS3...also since I didn't mount it I can take it out into the r-dome at night after the kids/wife go to bed and play the PS3 with out bothering anyone. I had the same idea that you did. There is a mount on ebay right now that rotates 360 degrees, flips up 90 degrees, and has a quick detach function in case I want to take the TV out in the dome to watch it. 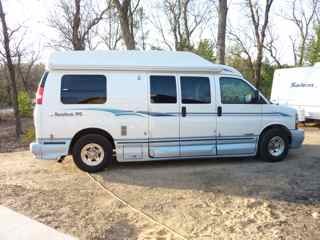 We have also added Directv. I am thinking to remove cabinet and put swing arm on the corner of exit wall. That way I can watch TV from kitchen and bed. However the wall looks so thin and also the carb or the wall, I am afraid to remove cabinet... May be stay as it is... Ours are 175! A few weeks ago I removed the small tv off the cabinet over the bed in the 175. 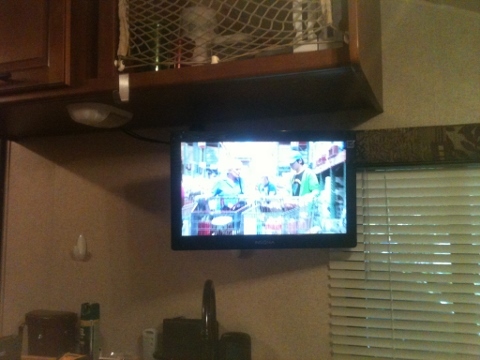 I bolted a new tv mount to the front of the cabinet for a 19" sony plasma. Our service man thought it would be fine and so far it has worked out well. 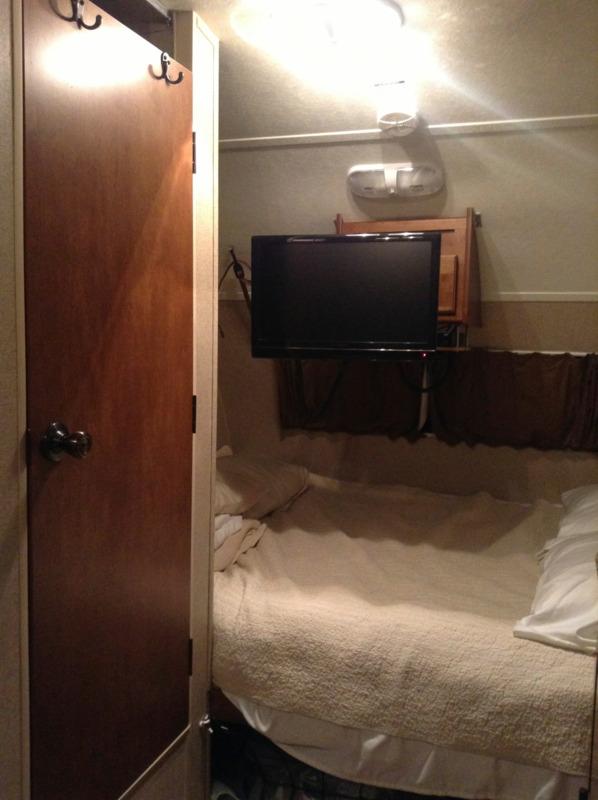 The TV slides into place easily and we remove it and place it on the bed when we are moving. The mount moves right and left and gives us a great picture when we sit on the couch. Now, if I could just get an antenna that works a little better than the one that came with the trailer we would be in could shape. I want to mount a 32" LCD to one of the wall of my RPOD. I have a 172 and a 32" (1080p)LCD would look fantastic behind the sink/stove. I can then run the cables straight up through the factory hole to connect the power and the cable. However, I am scared to drill holes through the RPOD walls to attach a VESA mounting bracket. I know that I must attach the bracket to an aluminum wall stud. But, I'm scared of damaging my brand new trailer. 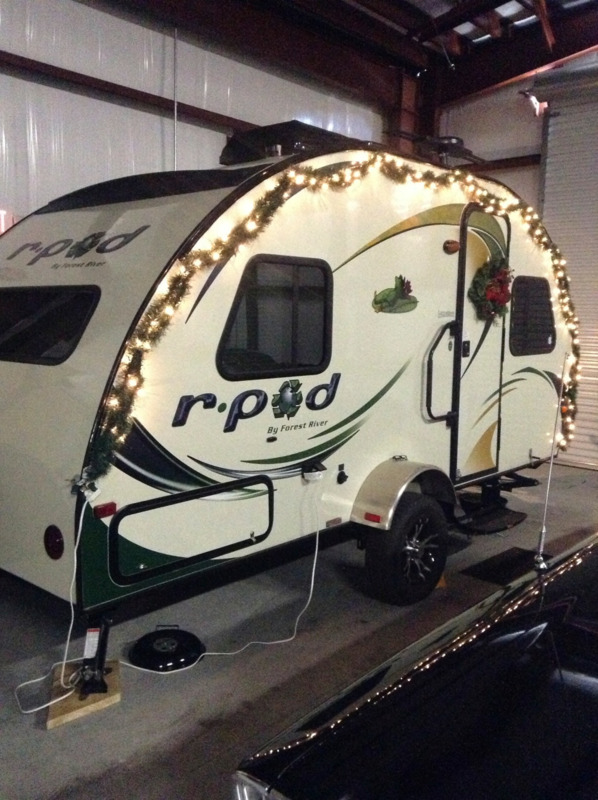 Has any one mounted a flat panel TV to their RPOD yet? If so, can you share your experence and post any pics if you got them. Thanks in advance. We haven't installed anything large like a 32" TV in that area, but we did mount a paper towel holder. The metal stud is located just above the window frame. I'm not sure you'll have enough room to attach the bracket. 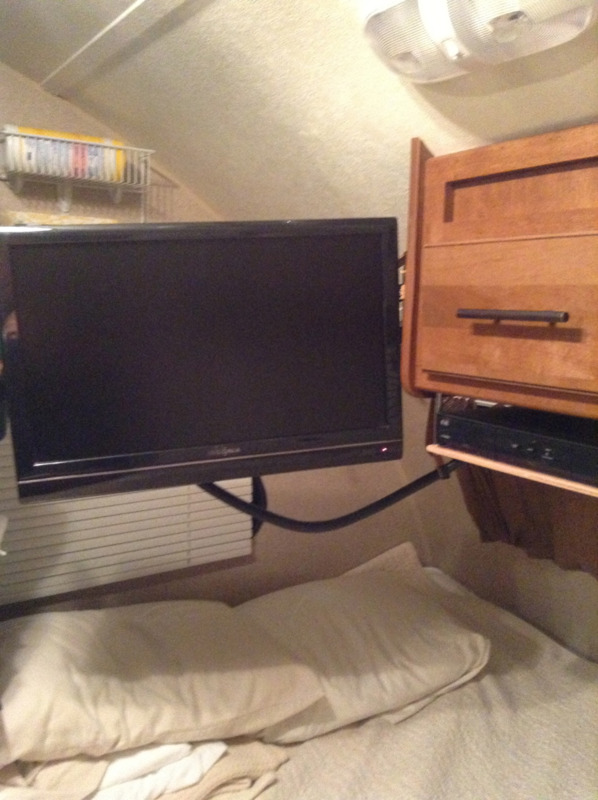 I just removed the Audiovox 9" system and installed a 19" Insignia 1080p TV using a full motion wall mount that has an articulating arm that pulls out 13" so the TV can be swung forward for viewing from the bunk area on our RP-172 or aft for viewing from the table area and tilts up or down 15 deg. I was able to use a stud finder to locate an aluminum frame member to mount the bracket to. Also tomorrow will be installing a Pioneer Double Din dash radio/dvd/cd unit with remote speakers and video feed to the TV from the DVD side of the unit. This is a photo of the basic unit and hope to have pictures of the install tomorrow. We put a 24" on the wall opposite of the fridge/stove. 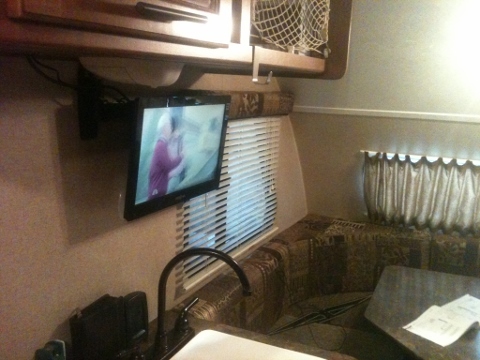 It is on a mount designed for travel - pull a pin and the tv comes out, we lay it flat on bed when driving. monitor and new DVD player. Here's a view from the area of the dinette. I reinforced the mounting points of the console to handle the additional weight.